Mix Genesis Thick Medium with colours while maintaining the same body. It will function as a colour extender and will be used for impasto painting. Great for the artist who likes to apply plenty of product to the canvas or create a 3D effect. You can add as much Genesis Thick Medium to the paint as desired. 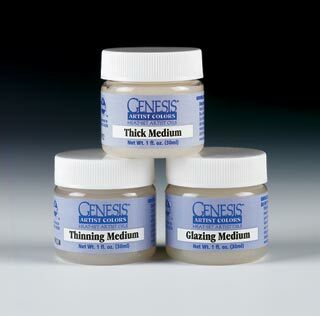 Use Genesis Thinning Medium to soften and thin the paint. Do NOT exceed 2 parts medium to 3 parts paint. Transparent washes can be achieved by adding Glazing Medium to the paint. Glazing Medium gives you a good layer of paint and the transparency you need.